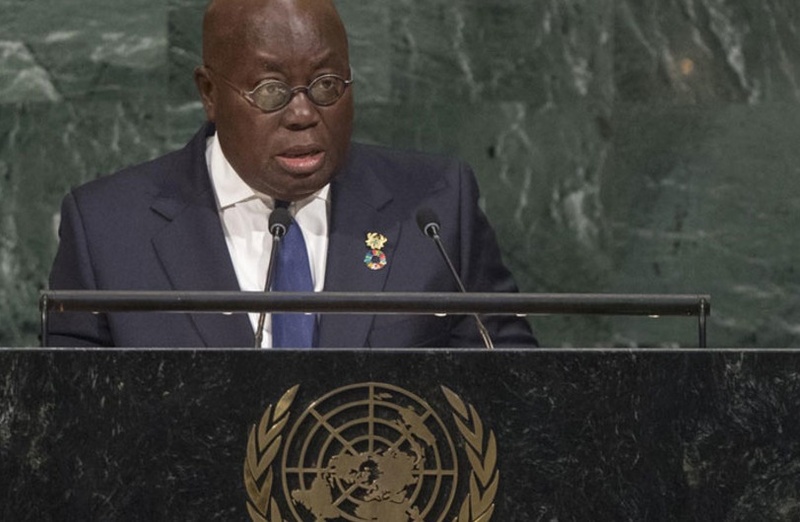 President Nana Akufo-Addo has addressed the 73rd UN General Assembly at New York. Find the full speech below. Ghana salutes the historical significance of your election to preside over this 73rd session of the General Assembly as the first female Latin American, and congratulates you most heartily, Madam President. Your election reinforces our common preoccupation that gender equality must be a central feature of the global agenda. Madam President, thirteen days ago, we laid to rest in his home soil of Ghana, Kofi Annan, the 7th Secretary-General of the United Nations, the first from sub-Saharan Africa to occupy this exalted position. On behalf of the people and government of Ghana, I wish to extend our heartfelt gratitude to the United Nations Secretariat, led by the Secretary-General, His Excellency António Guterres, and the whole world community for the outpouring of grief and condolences that we received on the passing of Kofi Annan. We were deeply touched that so many world leaders and people took the trouble to come to Accra to bid him farewell. Kofi Annan’s passionate and profound belief in the United Nations, and his certainty that a better organised and stronger UN would make the world a better place, is an ideal that should not be allowed to die. Today, we continue to be faced with the stark reality that resolutions, norms and any number of votes in the Security Council and General Assembly mean nothing without the political will to enforce them. We are still to come to terms with what the role of our organization should be. Should it just be a club of nation states that exists to look after their own interests? What of its constitution by “we the peoples”, as declared in its founding document? Does the theme we have chosen for this assembly have any relevance in real life, and do we want to make the United Nations relevant to all people? Do we want an organization that ensures shared responsibilities for peaceful, equitable and sustainable societies? Or should it remain the place to pass resolutions that are ignored with impunity? Madam President, when some of the nations of the world gathered in San Francisco 73 years ago, and signed the landmark document that created this organization, it was a very different world from what we have today. And I do not refer only to the difference in the numbers in the room on that occasion, nor the difference in the mode of travel that brought the leaders to that meeting and the jet planes that have brought us all to New York this week. Nor do I refer to the tweets by which we communicate now, and the elegant handwriting that they employed back in 1945. I refer to the theme we have drawn up for this General Assembly, and wonder if it would have been comprehensible to that group in San Francisco. It is a different world we currently live in, and we should accept that this organization must change to suit contemporary needs. Madam President, ten years ago as the General Assembly was starting its proceedings, the world was plunged into a financial crisis. The first scenes of that crisis were played out on a street not far from where we are gathered, but the consequences were felt and are still being felt around the world, and in small countries like Ghana. Some say that upheaval lies at the heart of the change in politics and outlook around the world. Today, as we speak, a trade war is being stoked between the two largest economies of the world. The consequences will affect those who have had no say, including small countries like Ghana. These events provide proof, if some were needed, that ours is an interdependent world. We in Ghana (and other parts of the African continent) are determined to pull our country out of poverty and into prosperity. We do not think that a nation needs to remain poor or become poor for others to become prosperous. We believe that there is room, and there are enough resources on this planet for us all to be prosperous. But it does mean that the rules and regulations that we fashion to guide our dealings with each other have to be respected by all of us. From the environment to trading rules, we have to accept that there cannot be different set of rules for different countries. Thus far, the United Nations provides the best vehicle for all nations to address their aspirations and challenges. Ghana has always displayed her belief in the United Nations and sought to contribute her share in making the organization a successful one. We have embraced the SDGs and integrated the seventeen ambitious goals into our national vision and budget. We intend that Ghana will in July 2019, take her turn to present our Voluntary National Review during the ECOSOC High-Level Political Forum, and we will share our successes and challenges as well as opportunities for new and continuing partnerships. Madam President, it is important to reiterate that advocating for a world order in which all countries sign up to obey the rules does not mean that we want uniformity. We take pride in what distinguishes us as Africans and as Ghanaians. 55% of the work of the Security Council last year had to do with Africa. Unfortunately, this invariably meant peacekeeping and poverty related issues. We no longer want to be the place that requires peacekeepers and poverty-fighting NGOs, no matter how noble their motives. Our regional bodies, like ECOWAS, and our continental body, the AU, are making systematic efforts, despite significant handicaps, to bring peace and stability to the entire continent, and, sooner rather than later, they will succeed. We know we must get our population educated and trained, and we are setting about it. We must address our infrastructural deficit. The traditional methods of tackling this problem will not provide the answer. We are looking for new ways to resolve it. Ghana, like many countries in Africa, is forging relations with China to make arrangements to help address part of our infrastructure deficit. This is not a uniquely Ghanaian or African phenomenon. It has not been lost on us that the developed, rich and well-established countries have been paying regular visits to China, and seeking to open new economic ties and improve upon existing ones. It is also not lost on us that a lot of anxiety is being expressed about the possibility of a recolonization of the African continent by a new power. We should, indeed, learn from history. It was at the turn of the 20th century that China’s first railways were built by Western companies, financed by Western loans to a nearly bankrupt Qing Dynasty, and it was under those circumstances that a certain strategic port called Hong Kong was leased for 99 years, and the rest, as the saying goes, is history. Today, the former victim of Western Railways imperialism is lending billions to countries throughout Asia, Africa and Europe to construct not only railroads, but also highways, ports, power plants and other infrastructure, and many businesses. The historical echoes are certainly worrisome, but, yes, surely, we must and can learn from history. We, in Ghana, must build roads, bridges, railways, ports, schools, hospitals, and we must create jobs to keep our young people engaged. It is obvious to us that the development trajectory we had been on for many decades is not working. We are trying a different one, and we would appreciate the support and goodwill of the world, especially in helping to stem the huge flow of illicit funds from the continent. It is in everybody’s interest that we, who are counted amongst the poor of the world, make a rapid transformation from poverty to prosperity. We are determined in Ghana, and, increasingly, in more and more parts of Africa, to chart our own paths to prosperity, and pay our own way in the world. We are no longer interested in being a burden on others. We will shoulder our own responsibilities and build societies and nations that will be attractive to our youth. We have the necessary sense of enterprise, creativity, innovation and hard work to engineer this transition. Hence, our vision of a Ghana Beyond Aid, indeed, of an Africa Beyond Aid. Madam President, it is equally important that the United Nations is reformed to be able to preside over this changed and changing world to which we all aspire. The powerful nations must be willing to adapt to the changes to make our world a better place. After all, we all inhabit the same planet, and we all owe the same duty of care to ensure its survival. The African Common Position on UN Reform, as expressed in the Ezulwini Consensus, remains the most comprehensive proposal for reform of the United Nations, particularly of the Security Council. It is time the global community endorsed it to create a modern United Nations fit for purpose in our time. May God bless the United Nations and us all.